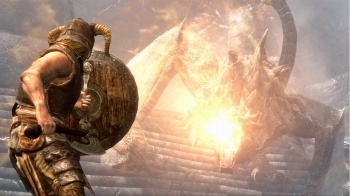 Three retailers, and three very different Skyrim pre-order incentives. There are still a few months to go until Skyrim comes out, but if you're Australian and want to grab a few extra bits of game-related swag, it might just be worth heading down to your local retailer right now and pre-ordering the game. EB Games has an exclusive, "while stocks last," edition of the game that comes with a steelbook case, a "premium" physical map, four art cards, and a hardback notebook stamped with the Skyrim logo. This edition will set you back $108 AUD. JB Hi-Fi is offering the same premium physical map and an official strategy guide for $109AUD. Last, but not least, is GAME, where you can grab the map and two Elder Scrolls novels - The Infernal City and Lord of Souls - for the slightly lower price of $98 AUD. Between them, the retailers have something for every type of Skyrim players. If you want to get a boost in the game itself, you head to JB Hi-Fi, if you love diving into the world of the Elder Scrolls, you head to GAME, and if you like having a some neat, Skyrim-themed items, then EB Games has you covered.